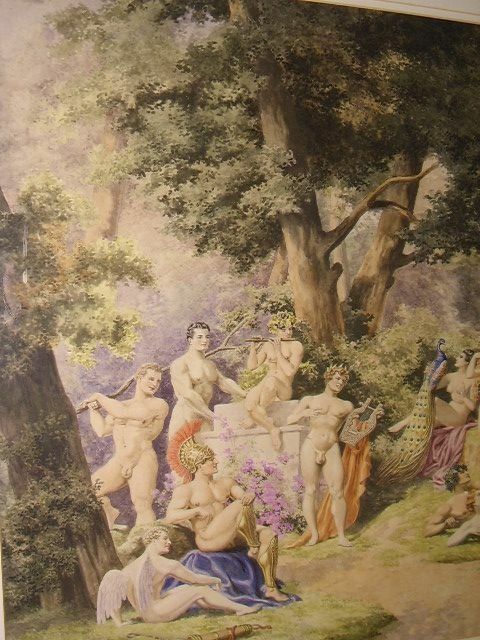 fine example of an extremely well painted watercolour,depicting Greek mythology with naked people playing various musical instruments. 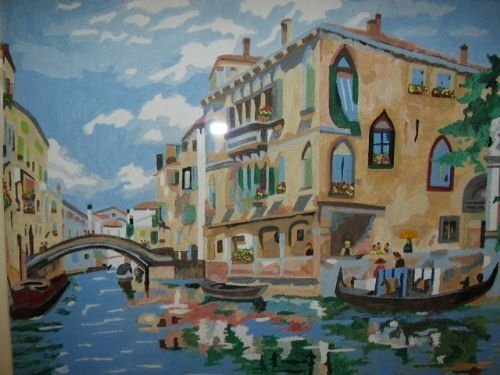 The colours are rich and vibrant and show the artists skill at being able to paint in great detail and achieve a professional accuracey to the way the figures are realistically depicted. 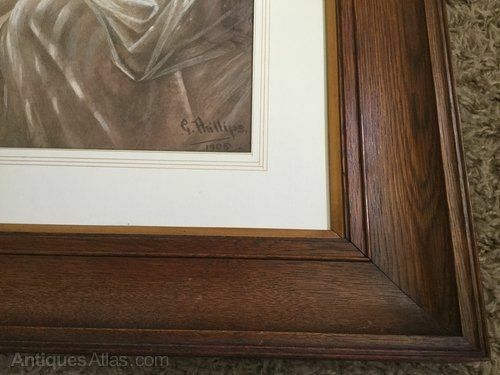 The painting has been properly conserved in a new frame and double border and is fully sealed. 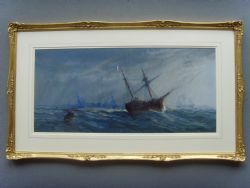 The Condition is Excellent throughout and is signed "ARTHUR BARRETT"distinctly in the lower left hand corner. Height: 30.5 Inches or 78 cm. Width: 37.5 Inches or 96 cm. 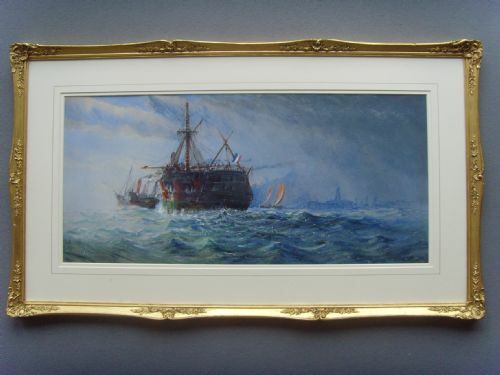 We are delighted to offer for sale this large stunning Edwardian marine watercolour by the artist W.J.N.Boyer, who has signed the painting in the lower left hand corner and dated it 1909. 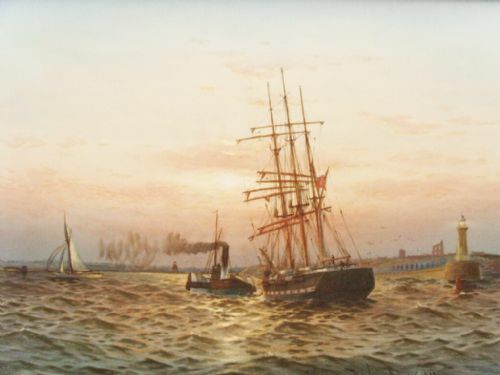 The painting depicts shipping at the mouth of the Tyne at Tynemouth at sunset, with a Tyne steam paddle tug towing a schooner into harbour. To the right is the lighthouse on the end of the North Pier, with the ruins of Tynemouth Castle and Priory on the headland behind it. The last vestiges of sunlight are streaming through the red streaked clouds and reflecting on the water. 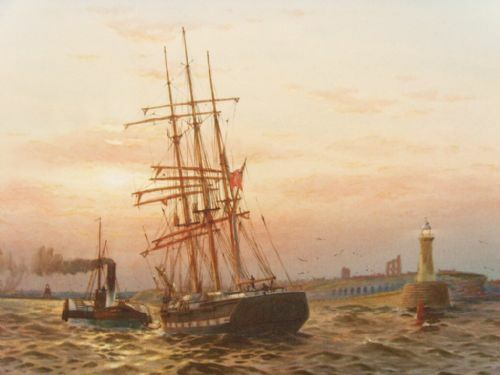 The North Pier which was originally curved in its design, was badly damaged by storms in 1898 along 300 feet of its length and was rebuilt by 1908 much straighter and with a new lighthouse, as shown in the painting. The lighthouse is still in use today. Although a very accomplished artist, we have been unable to find any trace of him in any of our reference books, or, as his surname can also be French or Belgian, in Benezit. 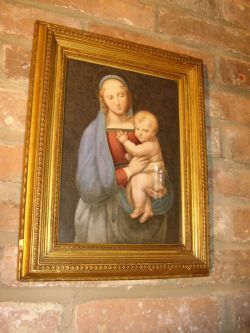 Due to the size of the work, we have not mounted it, but have newly framed it in a dark gilt rope design frame that complements it very well. CONDITION: Excellent. The frame is new. 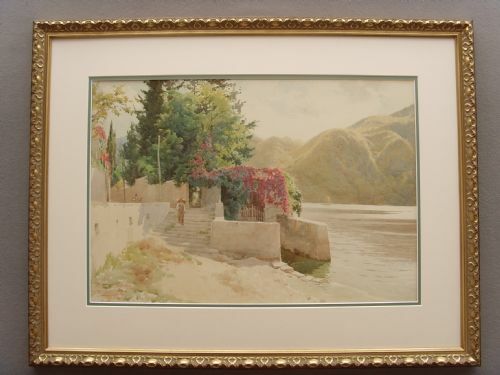 We are delighted to bring to the market this very desirable and sought after large watercolour painting depicting a beautiful view of an Italian Lake by the highly collected artist Robert George Talbot Kelly RBA RI RBC FRGS, who has signed the painting in the lower left hand corner and dated it 1909. 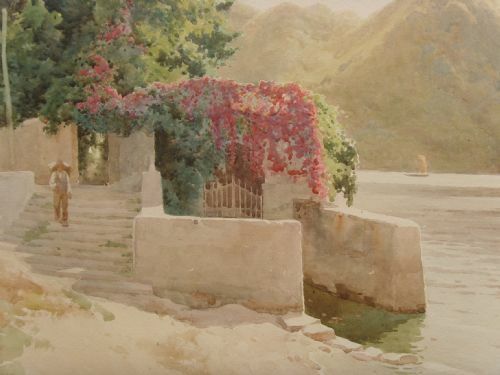 The painting depicts the lake with an arched wall covered in bougainvillea to the right of a long flight of steps, with a man with a pannier on his back walking down them. Within the arched wall is an iron gate which is the entrance to a boathouse. There is a lady and child further behind him on the path underneath the trees. Robert George Talbot Kelly was an orientalist, landscape and genre painter, author and illustrator. He was born in Birkenhead, Cheshire in 1861, the son of the Irish landscape artist Robert George Kelly. 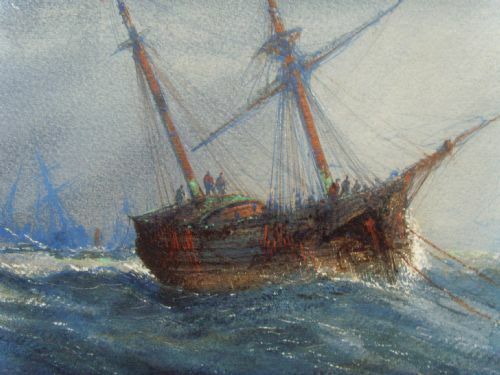 He left school in 1876 to take up work at a firm of cotton traders, but was also taught art by his father and, in the early days, exhibited under the name of R. G. Kelly Jr.
After a holiday cruise, he was inspired to become a professional artist. 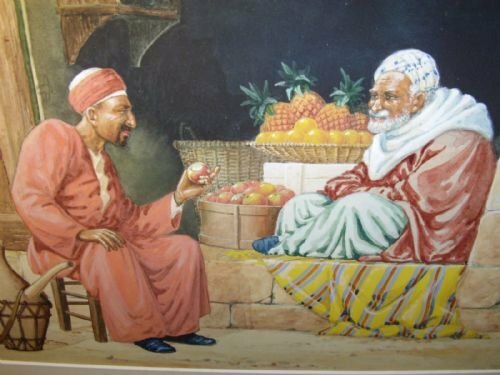 He left his job in 1882 and settled in Egypt, acquired a studio and became a fluent Arabic speaker. He travelled throughout the country, spending much time with the Bedouin, who he described in his book 'Egypt painted and described' published 1902. 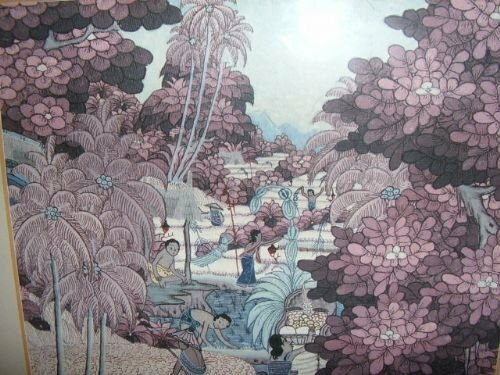 During this time, he travelled to Burma, where he influenced the development of Burmese painting in the early 20th Century and published 'Burma painted and described' in 1905. He later published 'Burma the land and people' in 1909. He also illustrated Slatin's 'Fire and sword in the Sudon' in 1896. In 1915, he returned to England for health reasons. He died at the Cancer Hospital in Chelsea on 30th December 1934. 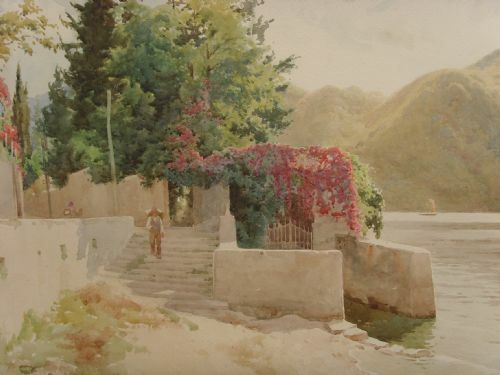 We could find no reference to him travelling to Italy, but we have found listed on google, a 'Catalogue of an exhibition of water-colour drawings of Egypt and the Italian lakes by R. Talbot Kelly'. 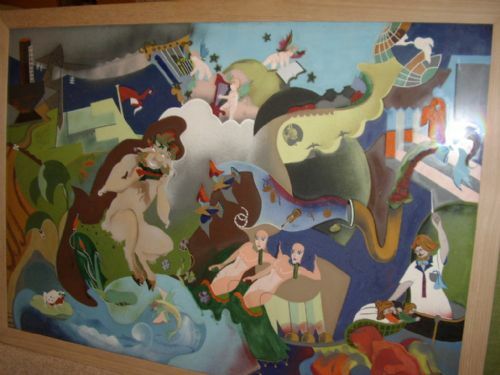 This painting may have been one of those exhibits. 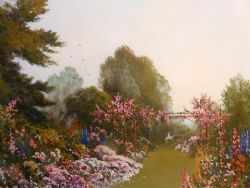 He was elected a Member of the Royal Society of British Artists in 1893 and a Member of the Royal Society of Painters in Watercolour in 1907. He was also a Member of the Royal British Colonial Society of Artists (RBC) and a Fellow of the Royal Geographical Society. He was married and was the father of Capt. Richard Barrett Talbot Kelly MBE MC RI, who was also an artist who specialised in birds and historical subjects. 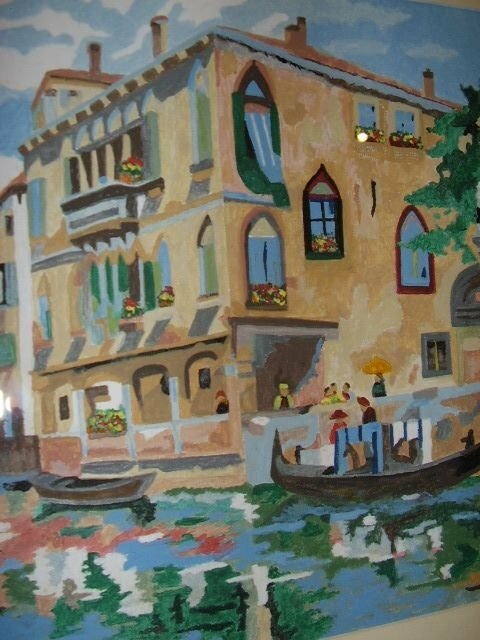 His granddaughter Chloe Talbot Kelly is also an artist. There are 7 of his paintings in the National Collection, in the Glasgow Museum, Newport Museum & AG, 4 at the Williamson AG & Museum, and National Museums of Liverpool. 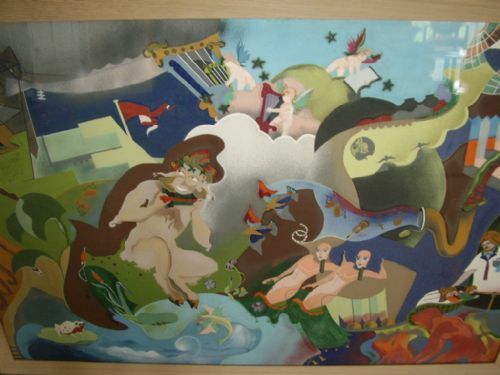 The record for one of his paintings is £18,000 (22,500 inc. premium) at Christie's in 2008. His auction prices vary and can average anything from £2000 upwards with results often achieving multiple times above the initial estimates. The painting has been newly double mounted in two tone acid free mountboard and is newly framed in a 1 1/4" bronzed frame. It will be supplied wired and ready to hang. Width 29 1/4" x Height 22 5/8" (74.25cm x 57.5cm). Very good with no foxing or fading. 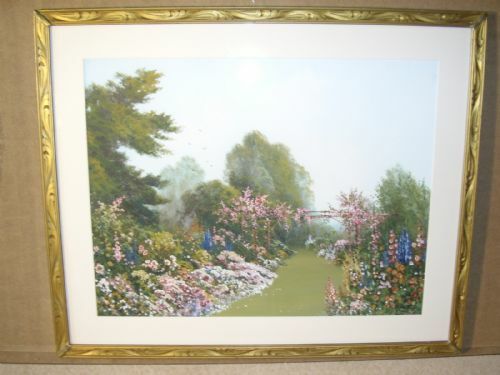 The painting has been tastefully double mounted and is supplied in a new antique decorative gilt frame. HOURS 10AM-10PM 7 DAYS A WEEK. BY APPOINTMENT ONLY (PRIVATE DEALER). This example is in the original gilt decorative frame with a lined gallery mount. 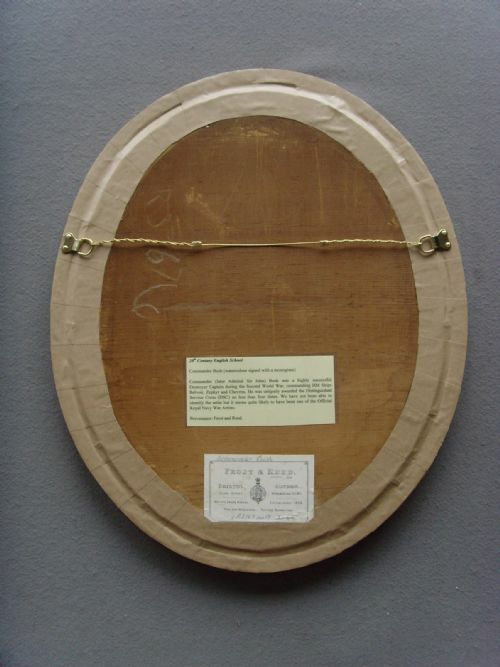 There is a label verso which states A.Woodgate Picture Framers,140 Fetter Lane London. 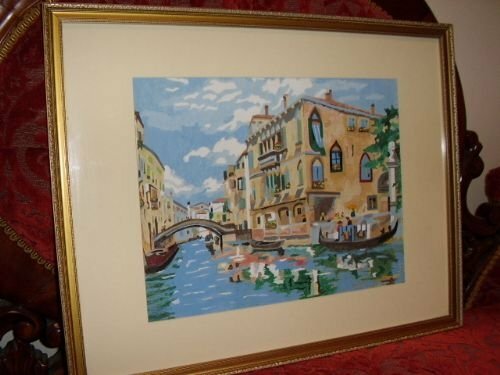 All in lovely original condition and ready to hang. 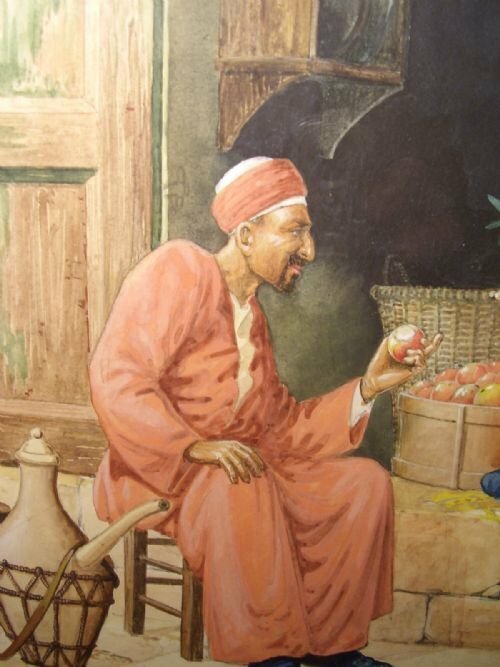 An extremely well painted watercolour depicting an Egyptian street seller bartering over the sale of his fruit,depicted in the doorway to his humble abode,seen sitting on a yellow,red and grey striped shawl,with an assortment of fruit filling his wicker woven baskets. 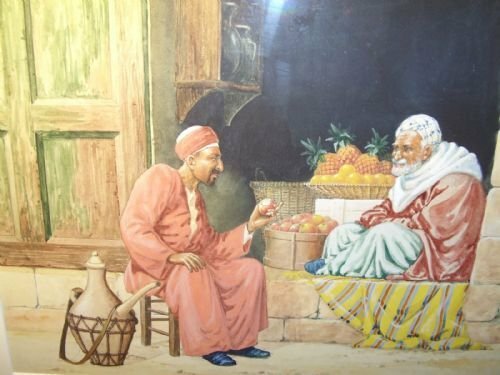 The buyer seen with a spouted water vessel.sits patiently on a chair,with a rosey apple in his left hand,proposing a suitable price to the wise old grey bearded man who listens intently. 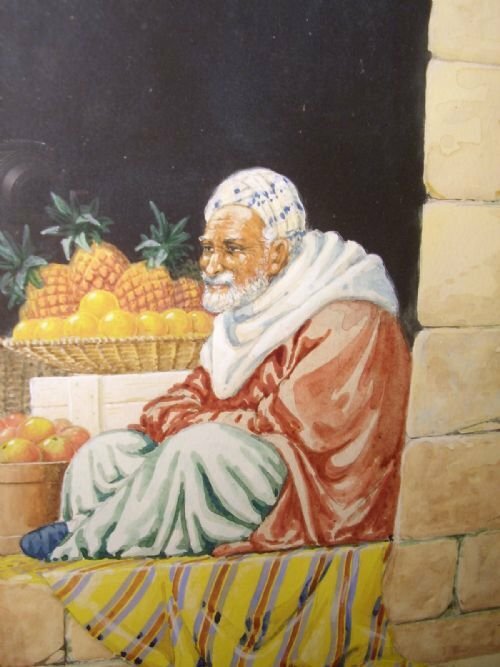 A large basket of ripe pineapples are painted with great detail in the background,with an oak shelving unit shown within the left hand inside of the doorway. The distinct bright yellow blanket brightens up the whole scene,and adds a spark of realism. 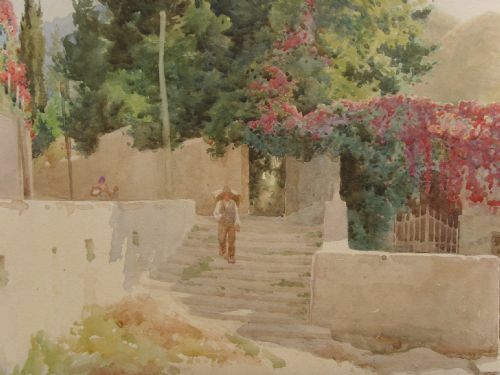 The overall standard of painting is top quality and worthy of the best collectors of fine watercolour art,with the subject matter being a desirable and interesting subject showing dailey life on the side streets of Cairo. A lovely wooden frame finished principally in a shiney black and dark rosewood inner veneer,with gold coloured decoration highlighting the outer & inner frame edges. 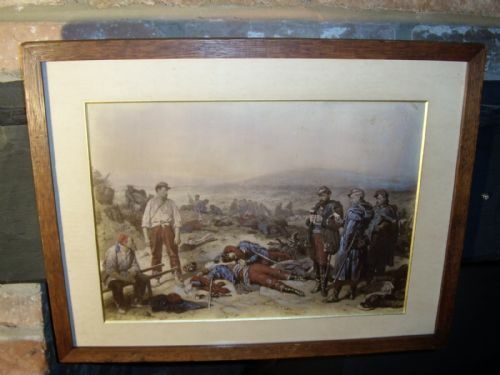 CRIMEAN WAR SCENE TITLED "THE TWO FRIENDS" AND DEPICTING THE BATTLE OF SEBASTAPOL AFTER AN ORIGINAL PAINTING BY HIPOLYTE BELLANGE CIRCA 1861 14.5 X 19 INS. A HAND PAINTED WATERCOLOUR OVER PRINT. 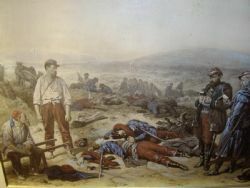 after the original painting in 1861 by artist Hipolyte Bellange and later published by leading French 19th century art dealership Goupil & Cie. 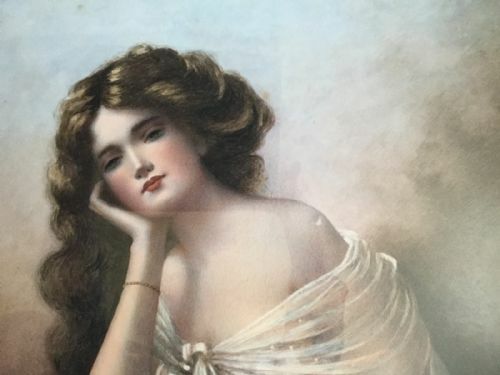 This fine hand finished example is stunning re the quality of overpainting,as there are no real signs of this picture ever being a plain chromo print. Finished in an early Victorian half inch oak frame and safely preserved under glass. 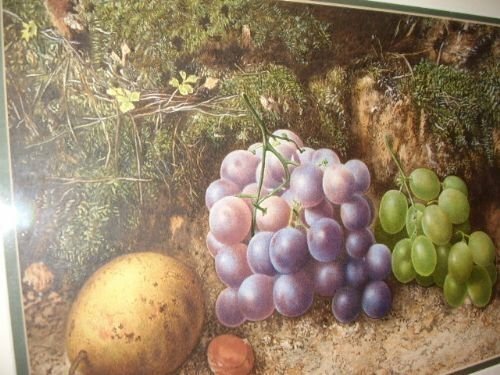 The condition is very good throughout and retains the sharp colours and clarity as good as any original watercolour painting. 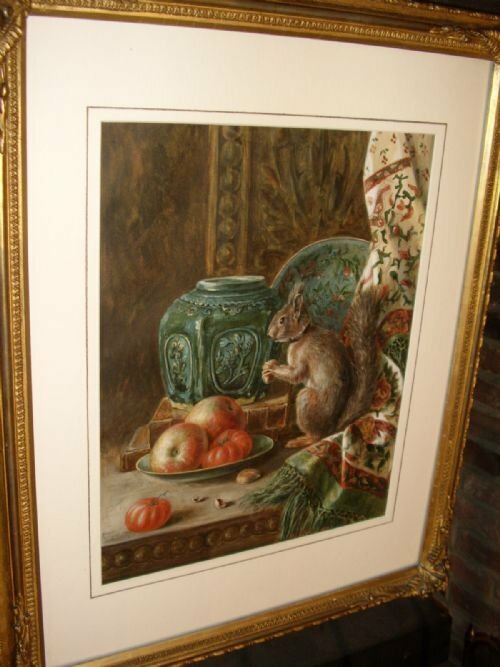 This example has a copy of the artist signature in the lower left corner,behind which is stamped the company name Goupil,who produced this item. 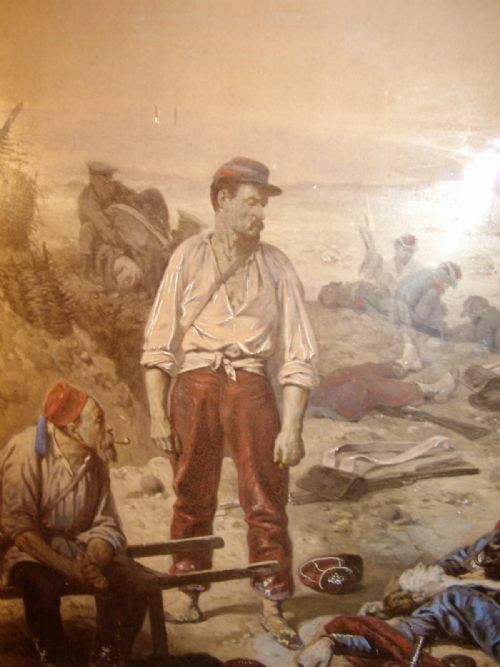 In all a very interesting early Cimean war picture,of which few survive and would be an excellent collectors item retaining a visual record of life at war during this period. 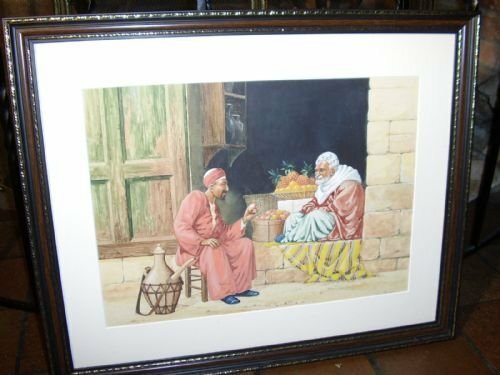 The painting is titled "The Two Friends". 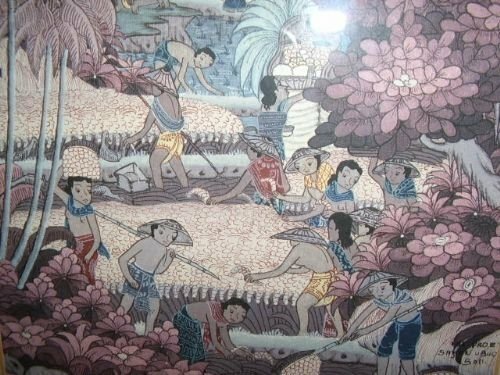 A magnificent and tremendously detailed painting depicting rural vaillage life scene in Bali as the tiered land is worked. 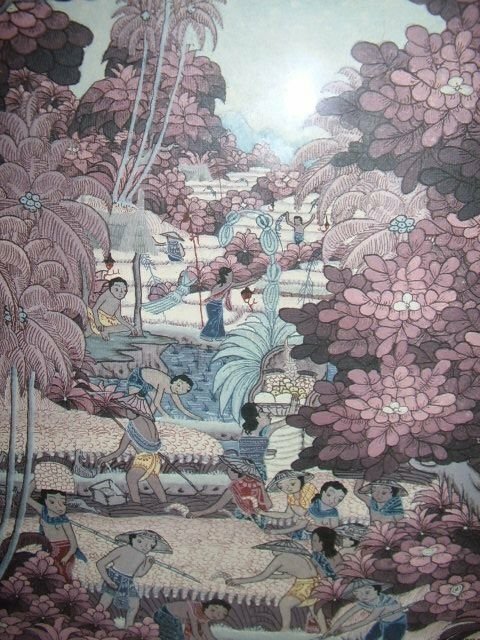 Painted and drawn in Ink and infilled with great care and attention to detail,being highlighted and coloured by hand in watercolours, with enhanced flowers throughout in a lovely mauve finish. 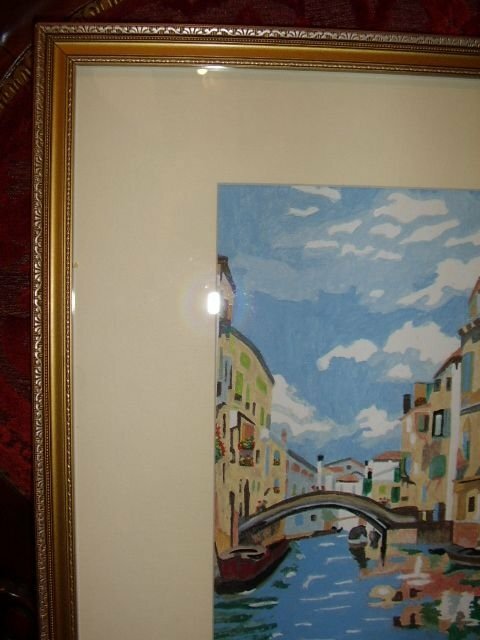 Condition is excellent and must have taken hours to execute in such minute detail. 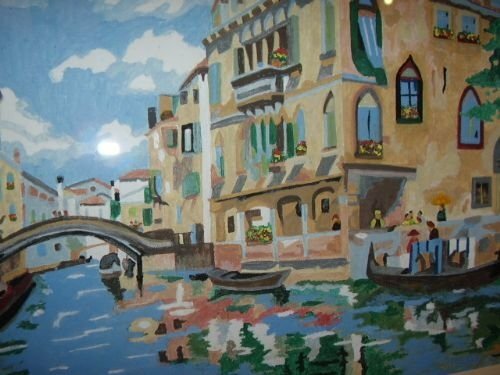 The colours are vibrant and sharp,all being painted with a very steady hand indeed. 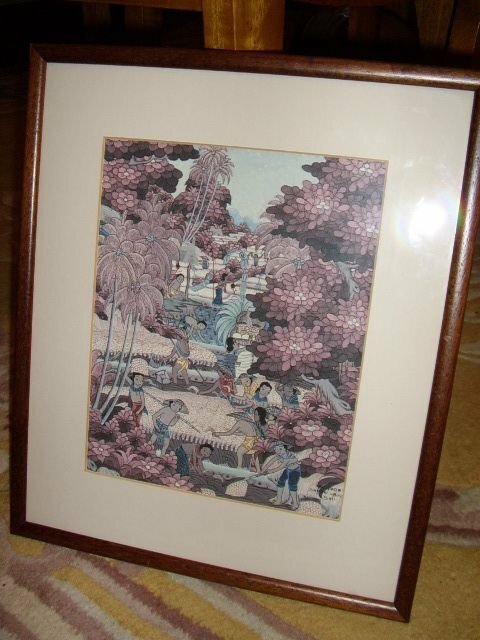 Framed in a plain Mahogany with off white card beval cut border,secured under glass. 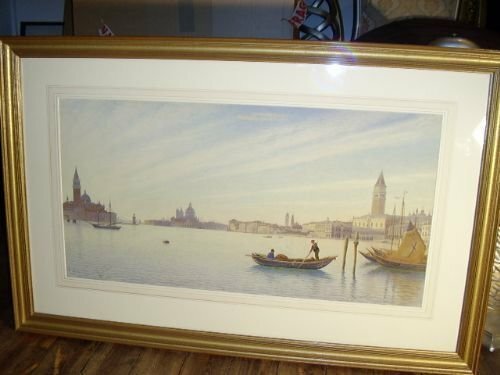 A very unique watercolour of Venice with Gondola and bridge in the background. Colourful mosaic stlye of abstract painting which captures the eye immediately. The clever interaction of shapes and colours, capturing the reflections in the water. The clouds are cleverly formed by painting the blue areas to reveal the background base white paper as clouds. A lovely frame and gilt finish and with a cream card border. 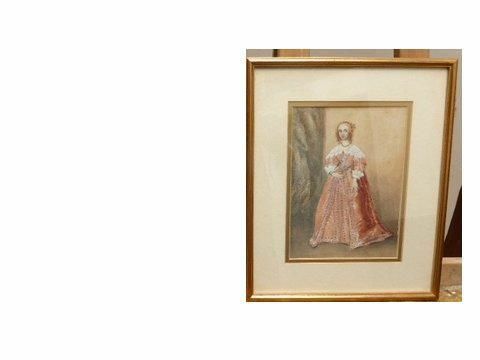 Fine Quality Sought after Watercolour Painting under glass of an Elizabethan Lady depicted wearing her beautiful satin dress,enhanced with pearl decorations and elaborate lace sleeves and pleated collar. 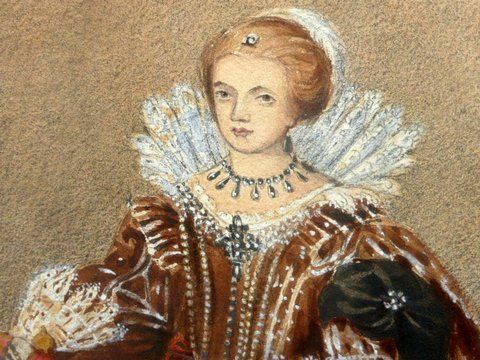 An early watercolour cabinet portrait of a Tudor Lady,which is considered to be of Queen Elizabeth 1st Tudor,being lightly sketched in advance of careful colouring and addition of the fine detail. Condition is good for the age. Dateline is estimated to be late 19th -20th century. Fine Quality Sought after Watercolour Painting under glass of Princess Royal Mary Henrietta Stuart,depicted wearing her beautiful tudor satin velvet gown. 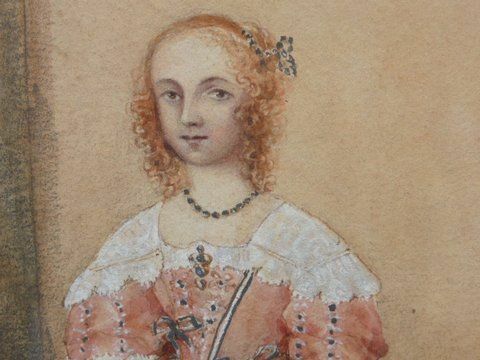 This early watercolour of a Tudor Princess,has been lightly sketched beforehand,in advance of careful colouring,and the addition of fine detail. Dateline is estimated to be late 19th-20th century. 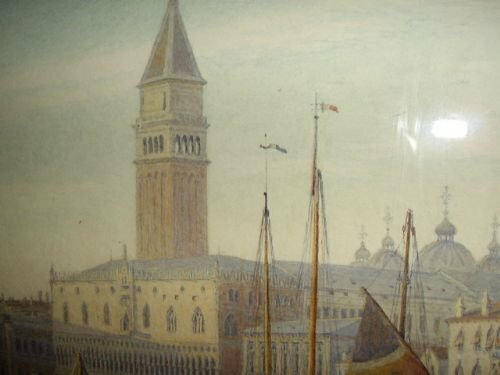 VENICE Watercolour by one of the greatly sought after Pre Raphaelite artists Anna Blunden. She was born in London in 1829 and was the daughter of a book binder and die in 1915. She worked as a Governess 1852-3 but wanting to better herself and became a superb self taught artist who often practised by copying art at the British museum and National Gallery. 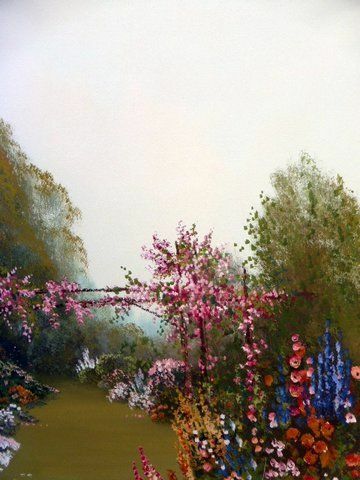 She received some informal lessons from Ruskin.She first exhibited in 1854 and worked in portraiture and as an art teacher in Exeter.Working in oils initially and later in watercolours. 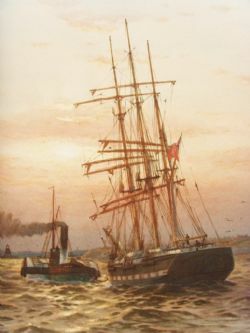 Travelling on the continent in 1867-1873 she married her sisters husband after the death of her sister and later was known as Mrs.Anna Martino. Her most famous painting was Song of the Shirt,which was sold in 1993 by Christies for £8,250. Her last recorded exhibition was in 1915 being the year she died.Many of her fabulous works were unfortunately destroyed during the bombing of Exeter in WW11. 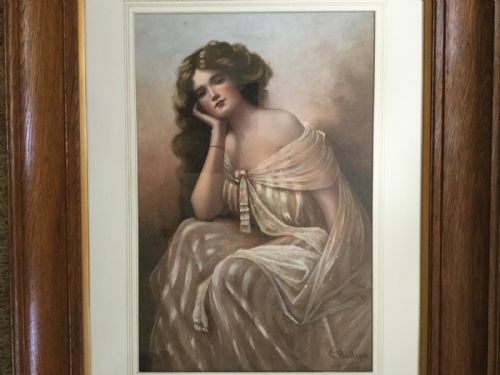 This is an extremely large and rare surviving example which has her hand written receipt for £110 and home address originally in Edbaston Birmingham England,on the back which itself is 136 years old also. 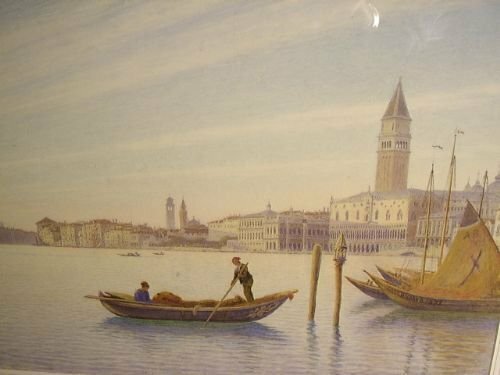 The watercolour is signed on the Gondola and has also been marked with her monogram initials AB and dated in the same place too. Needs to be seen in the flesh to be fully appreciated.Overall condition is excellent.The frame is substantially built around the painting with a firm ply lined back to seal it in from any moisture. IMPORTANT WORK EXHIBIRED AT THE ROYAL ACADEMY. 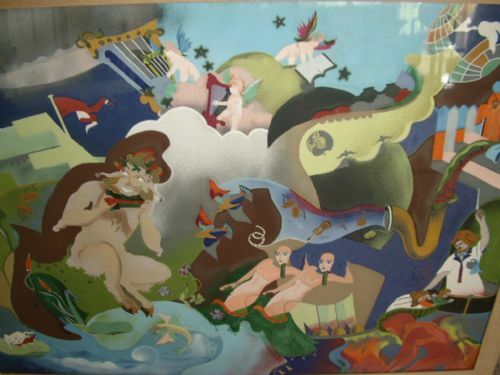 Excellent modernistic mixed nedia work painted by talented artist Miss Eileen M Moult,titled PAN and produced as a design for a mural,being signed with various labels verso. A very colouful and well balanced interesting work,which captures the imagination and engages ones thought process in a world beyond ours. 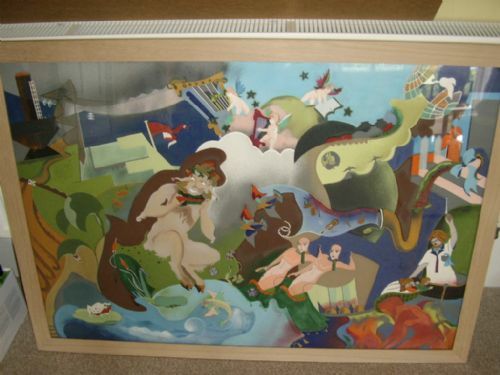 Executed in amazing detail,being full of vibrant bright colours and with a depth of charactor and charm. Must have taken hours of careful work to produce what is undoubtedly a very advanced design for 1938 and so very commonly seen today in so many famous artists contemporary works. 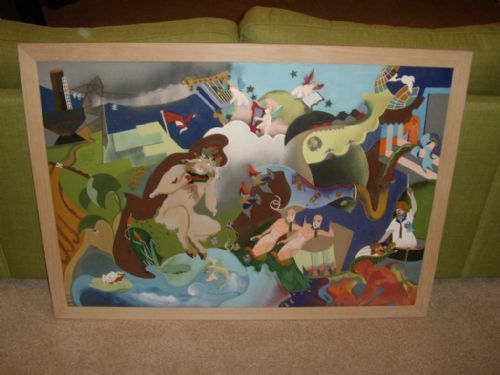 An extremely pleasing painting,very much a tremendous conversation piece. A rare item of historical importance in todays modern arena of contemporary art,for such early designs are rare to discover. Miss Moult's superb example was clearly years ahead of itself and would be at the top of the pile in standard even compared to todays top designers. Recently re-framed in a solid oak natural finish to suit todays modern minimalistic environment. Fully strung and ready to hang. 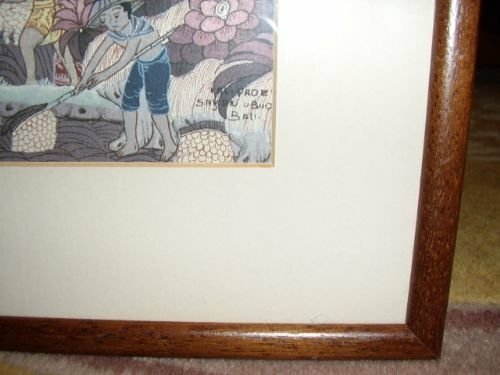 The original frame was dark stained oak of same design as replacement,but had been overpainted in cream paint in the 1960's and was too distressed to retain and save. 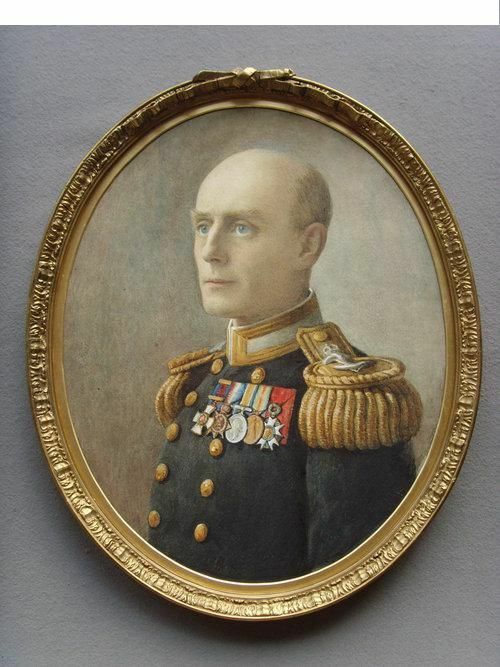 LIEUTENANT COMMANDER ATHELSTAN PAUL BUSH was a Royal Navy Officer who was commissioned on 4th August 1914. 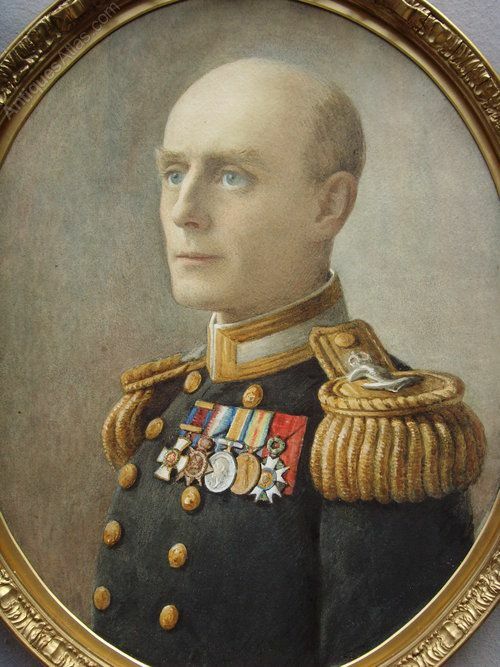 Bush Commander Athelstan Paul, DS) 1919 RN Retired. Only son of Col. Paul Bush CMG, CBE. Born 11th June 1892. Married lst Prudence Cheney (died 1930). Married 2nd Elma Rose Pomeroy Salmon. Entered Royal Naval College, Osborne, 1905. Midshipman 1909. 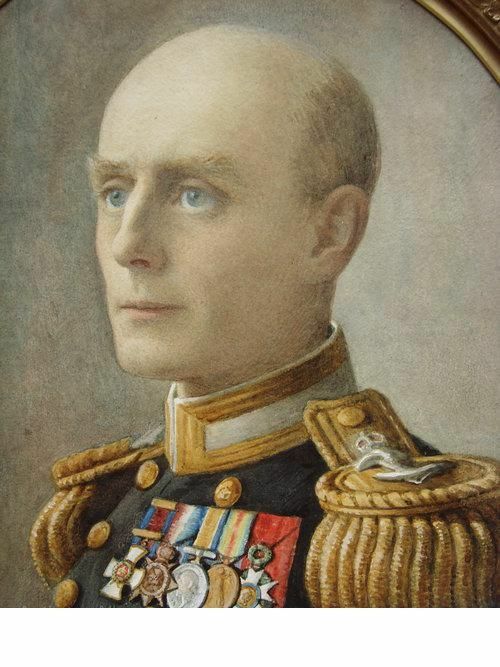 Sub Lieutenant 1912. Lieutenant 1914 (HMS Doon) Lieutenant Commander 1922. 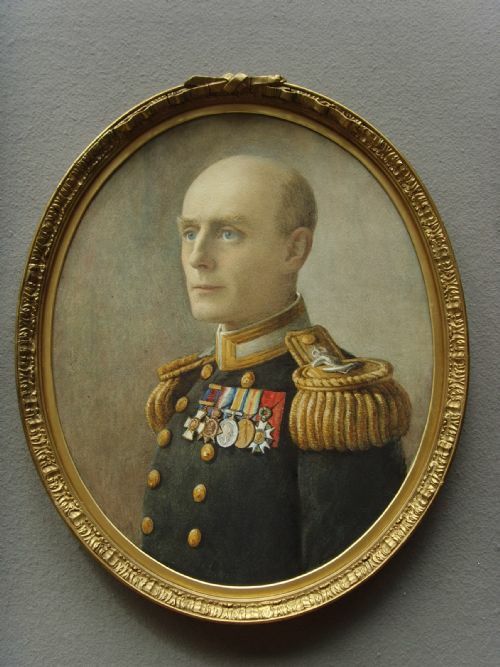 Served as First Lieutenant of HMS Spitfird in the Battle of Jutland (wounded, awarded Leion of Honour by French Government 15th September 1916). Served as Staff Officer to Australian Naval Board Melbourne 1921-23. staff Officer to Commander-in-Chief China 1924-26. Retired 1932. Address: Tockington Court, Nr. Bristol. BIOGRAPHY & HISTORICAL FACTS WITH WARTIME PHOTOS. PHOTO OF COMMANDER BUSH FROM AROUND 1923. PHOTO OF HIS MEDALS AS WORN IN THE PORTRAIT. The portrait is framed in a 1 3/8" oval gilt frame and slip with ribbon surmount and will be supplied wired and ready to hang. 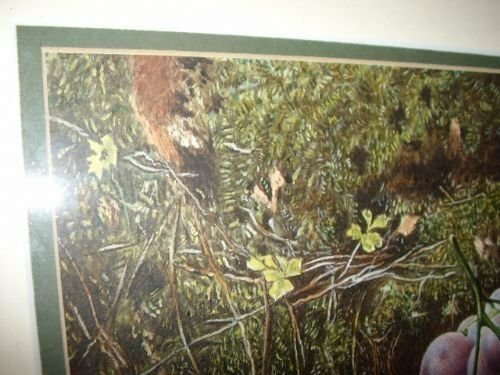 A Signature is visable with the initials ? R.W seen in the lower right margin. Very good with no fading. There are a couple of imperfections in the paper (not foxing) and some cracking to the frame, consistent with age. 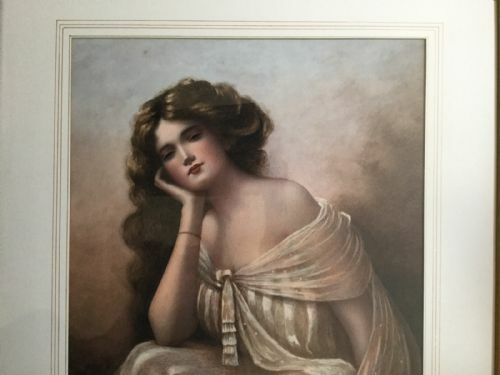 I am delighted to offer for sale this stunning watercolour portrait of a beautiful young lady whose relaxed pose is captured in amazing details and is painted to an excellent professional standard. 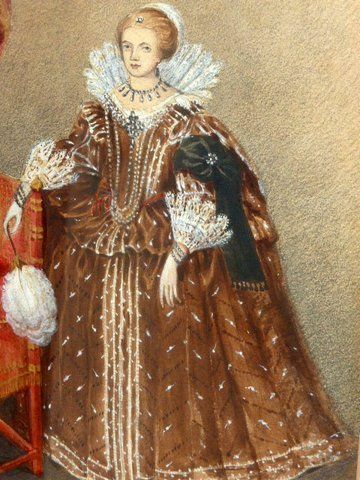 This elegant young lady has long curly dark auburn hair and wears a long silk gown with tastles. Her lips are well embellished with a red lipstick very neatly applied. She wears a fine gold coloured wrist bracelet and looks dressed for an evening of entertainment. The portrait has been double mounted with acid free board and has pencil thin gold and red pin striped linesaround the whole. The condition is excellent being well preserved under glass and sealed properly with gum tape verso. 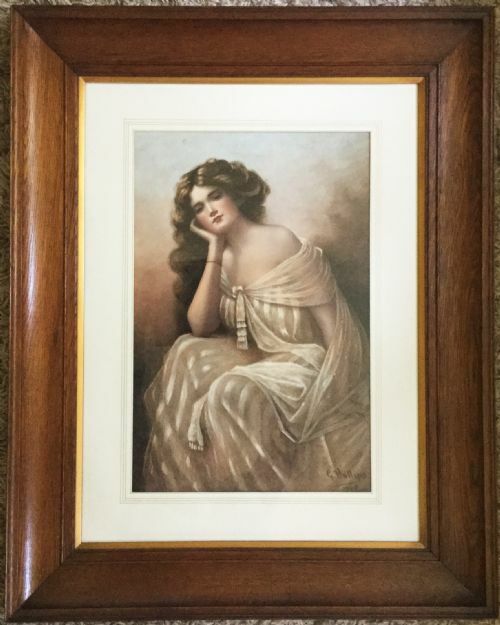 19thc Solid Oak 4 inch width frame with 1/2 inch gold inner slip.All in A1 order & ready to hang. 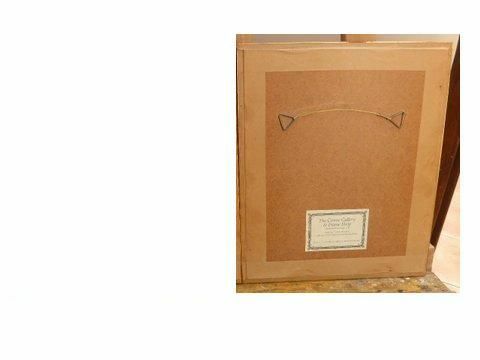 The medium oak crafted frame is made from solid oak with a beautiful grain and has been recently prepared with bees was to shine and smell nice. 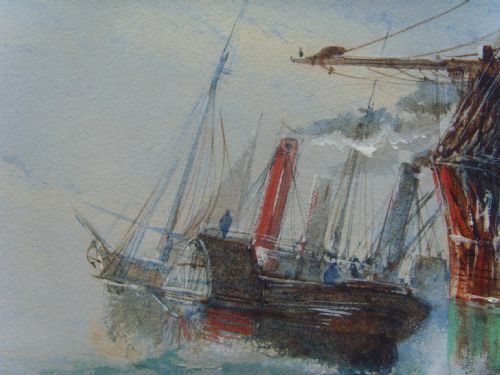 MARINE WATERCOLOUR OF A DAMAGED FRENCH WARSHIP BEING TOWED BY A STEAM TUG INTO HARBOUR TITLED VERSO "TOWED TO HARBOUR" BY ARTIST JOHN ROBERT MATHER (B1834-D1879)INITIALED RJM & APPROX.SIZE 33 X 20 INCHES OVERALL. 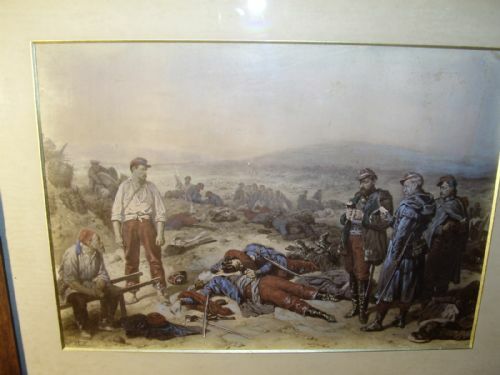 We are delighted to offer for sale this large and beautifully executed watercolour of exceptional quality by the Northumbrian artist John Robert Mather, who has initialled the painting J.R.M. in the lower left hand corner. 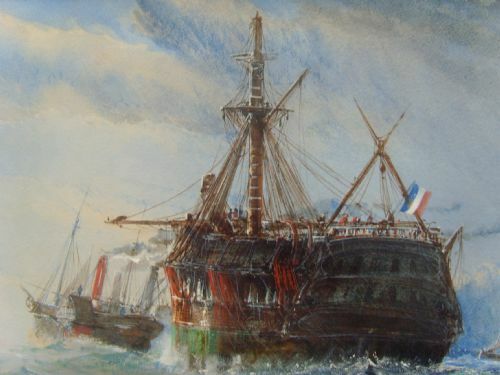 The painting is entitled verso on a piece of the original backing board, 'Towed to Harbour',which is attached to the reverse of the more recent backing board. 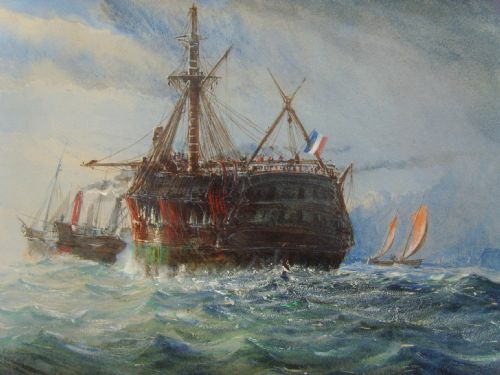 The painting depicts the damaged hulk of a French warship being towed into harbour by a steam powered tug. The harbour bar is visible in the distance and there are other sailing vessels within the harbour and one very close to the warship. 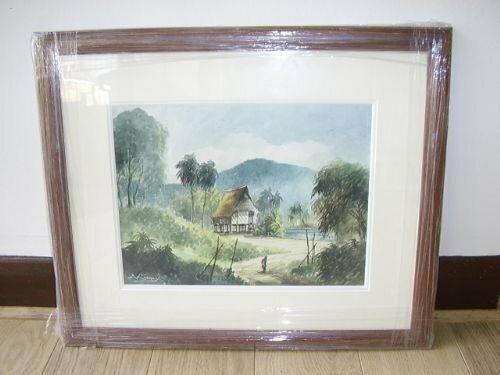 This is one of a pair of watercolours by this artist that we are listing. He was born in Newcastle, although we can find no registration of his birth, although his death was registered at Tynemouth in 1879. 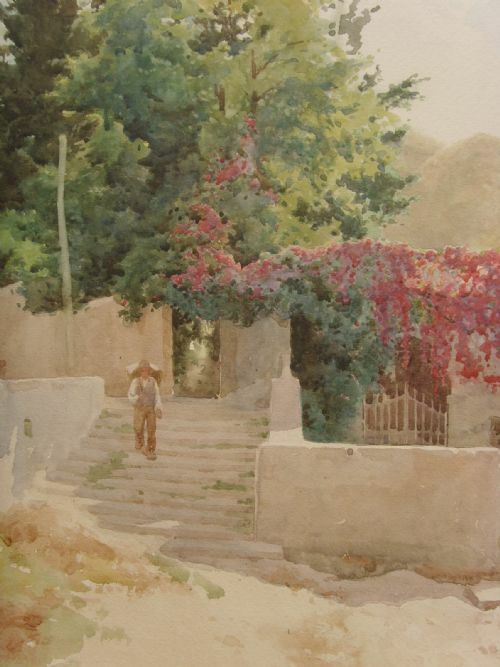 He was a marine watercolourist primarily, although some of his landscapes do exist. 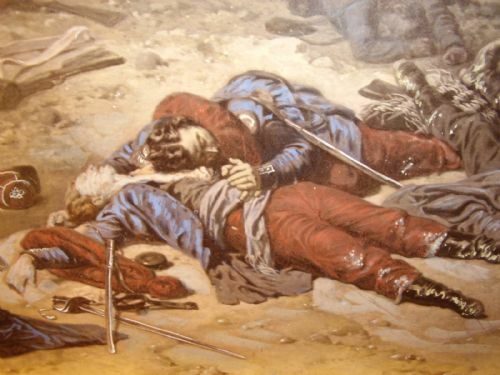 He was a retired Lieutenant in the Royal Marines 22nd Regiment at Barras Bridge Newcastle and had retired from the military by the age of 26 according to the 1861 Census. 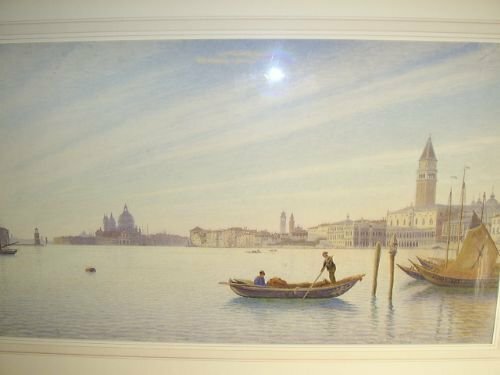 This information is listed on the back of one of his watercolours sold at Christies's, which was a view of Arno in Italy. 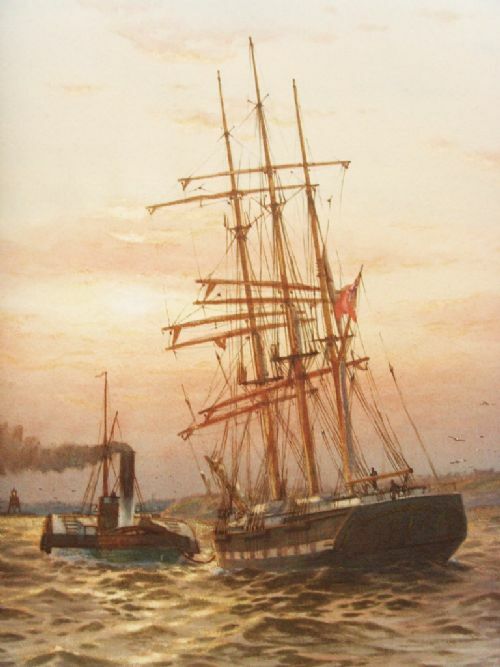 He was known to have travelled on painting expeditions in Norway and Italy during the 1860s and 1870s. He is believed to have lived in Cullercoats, near Tynemouth in the last years of his life. 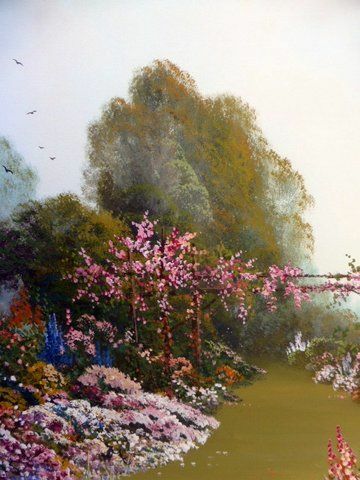 There is some confusion between this artist and an Australian artist by the name of John Mather, who signs J. Mather, usually followed by the date. This artist was born in Hamilton in Scotland, studied art in Glasgow and emigrated to Australia in 1878, becoming a successful artist in that country and being appointed Curator of the Melbourne Museum in 1916. Both artists are often confused with each other by sellers.John Robert Mather was a much more accomplished artist appealing to buyers with a good eye for amazing quality,detail and accuracy. DATE: Circa 1850 Mid Victorian. MEDIUM: Watercolour heightened with body colour and gum arabic. 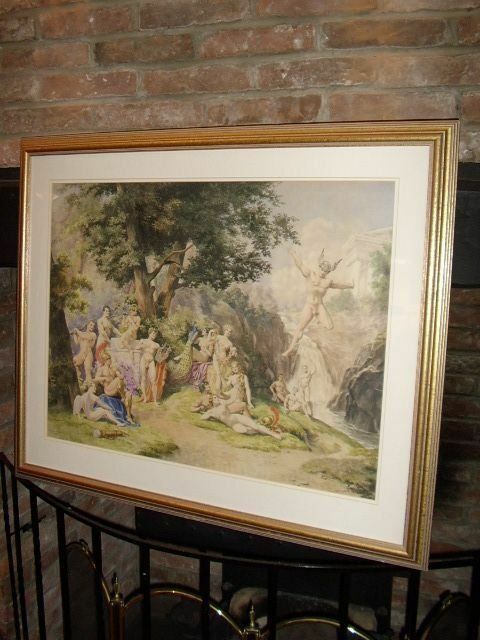 Excellent condition throughout with no foxing or fading,with the mounts in very good condition. 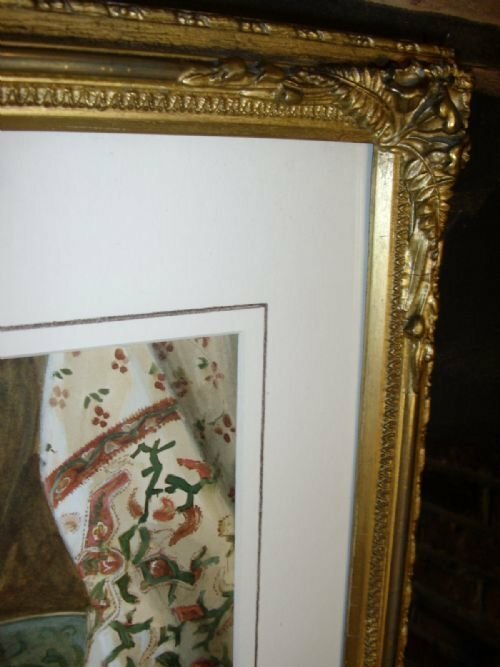 A Beautiful original decorative antique swept plaster gilt frame,which greatly enhances the appearance. The painting is double mounted in relatively new mounts and is ready to hang. 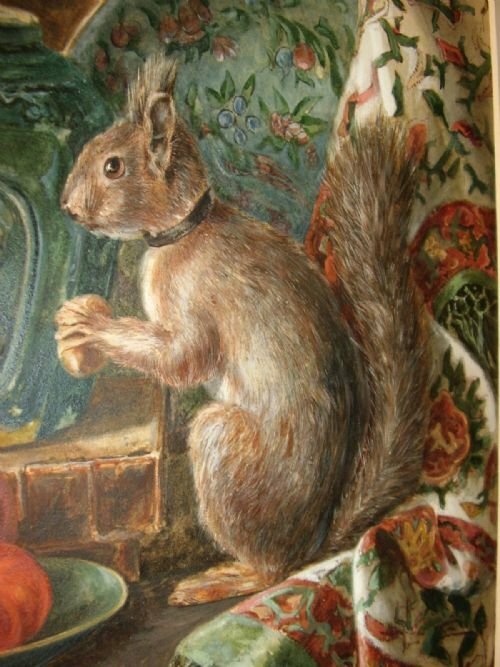 A stunning quality watercolour depicting a large brown squirrel sitting with delight as he carefully removed the shell of a nut in readiness to nibble. 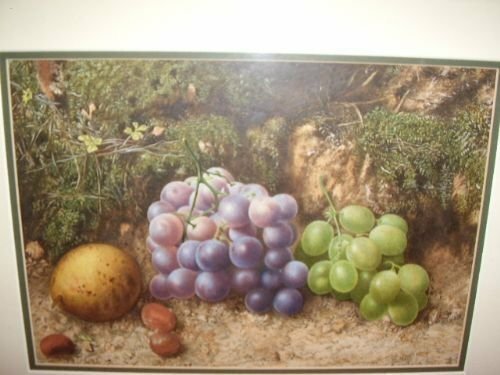 A early victorian oak table is beautifully painted with two large leather bound books shown,having a green porcelain flower vase sat on top of them and a small pale green dish of apples and tomatoes. 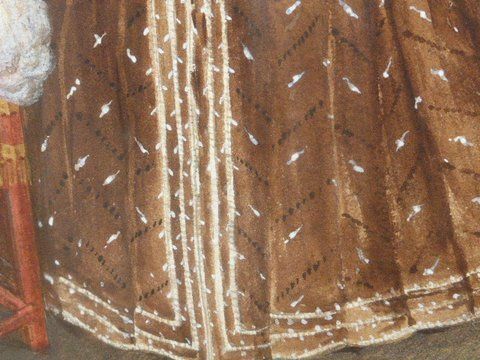 A decorative patterned curtain is shown in the right hand margin,draped over the corner of the table,having a green tastled trim along the edge. 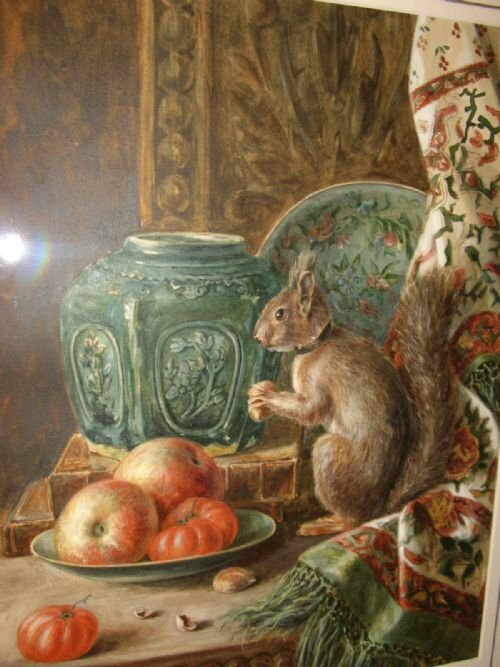 Great attention to detail is seen in this quality watercolour,which is both sharp and executed in vibrant colours,with the large squirrel being the main feature,adding realism and life. 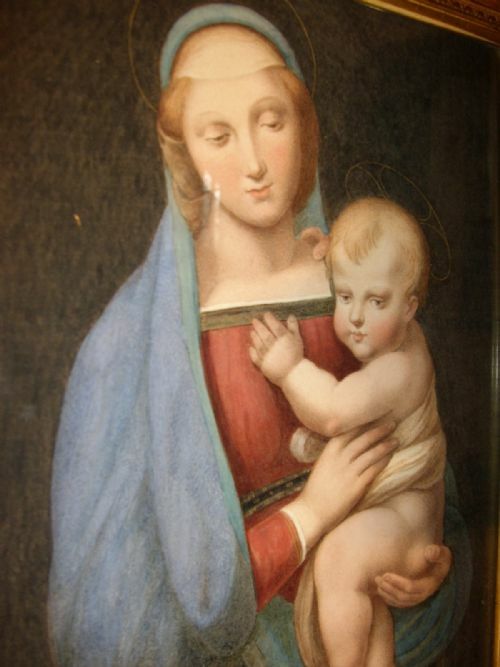 The great Italian master, Raphael Sanzio (commonly known as Raphael) painted the Madonna del Granduca. 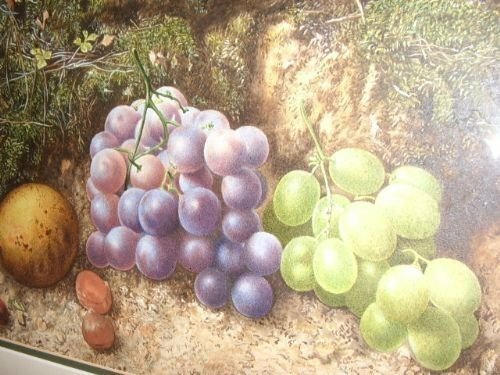 The painting was done in 1504 using the medium oil on wood. Its dimensions are eighty four centimetres by fifty five centimetres. 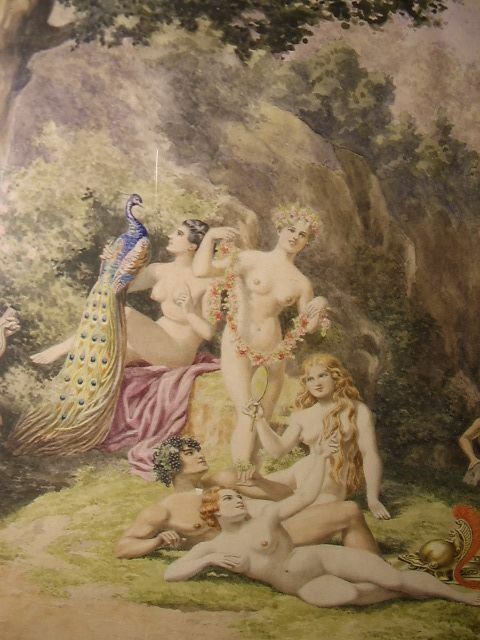 Currently, the painting is located at the Palazzo Pitti in Florence. 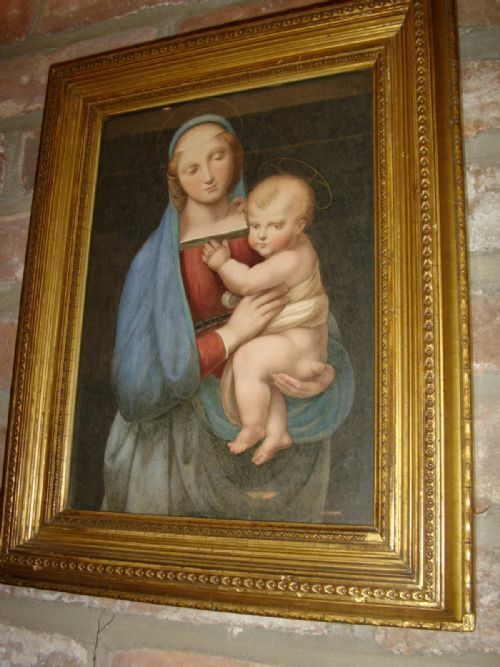 The painting was said to be somewhat influenced by Leonardo da Vinci who Raphael was later acquaintanced with. His influence can be observed in the way Raphael used sfumato. 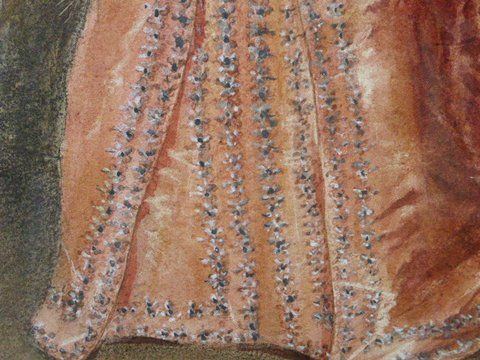 The painting derived its name from the Grand Duke of Tuscany who used to own it. This piece of art is truly a classic. 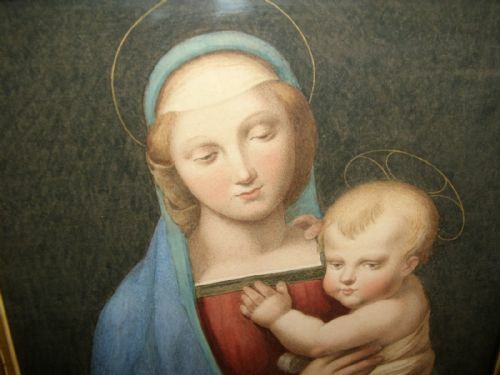 It is considered as one of the most recognizable examples of the Madonna and Child. Raphael was enormously productive, running an unusually large workshop, and despite his death at 37, a large body of his work remains. Many of his works are found in the Vatican Palace, where the frescoed Raphael Rooms were the central, and the largest, work of his career. The best known work is The School of Athens in the Vatican Stanza della Segnatura. After his early years in Rome much of his work was self-designed, but for the most part executed by the workshop from his drawings, with considerable loss of quality. He was extremely influential in his lifetime, though outside Rome his work was mostly known from his collaborative printmaking. After his death, the influence of his great rival Michelangelo was more widespread until the 18th and 19th centuries, when Raphael's more serene and harmonious qualities were again regarded as the highest models. 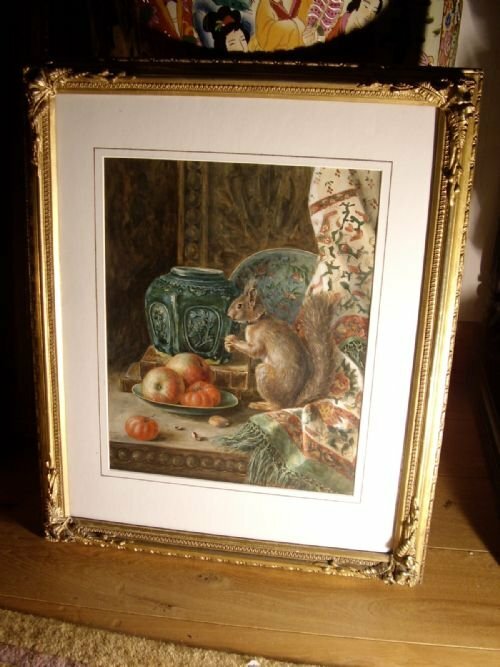 Very good for the age and preserved under glass in the original decorative pladter gilt frame. 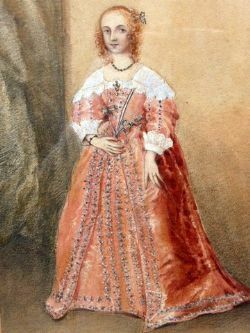 The finely executed painting has been executed by a good hand,with excellent attention to facial details,feet and hands.The painting still retails good vibrant colour and is a superb example. Original decorative plaster and gilt frame. The tiny missing piece left hand side has been nicely repaired,otherwise in lovely order throughout. Estimated to be late 19th Century. 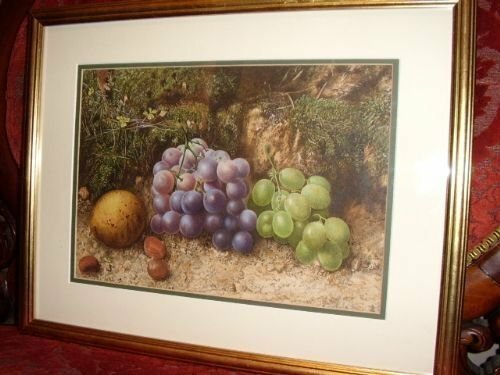 Copy of "The Madonna Del Granduca"
A fine quality watercolour depicting a selection of fruit on a mossy bank with exceptional detail and precision in the finishing. 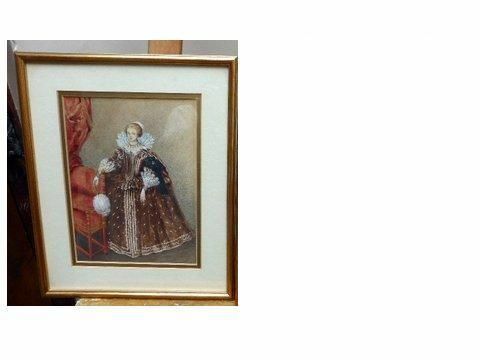 This example has been re-mounted with new double borders as well as having a new gilt frame. 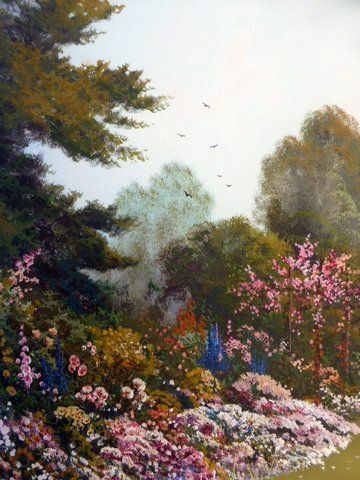 The painting is not signed or dated from what I can see, although it my be the case that there is are tiny initials hidden somewhere in the flora. Condition is A1 and there are no signs of fading. 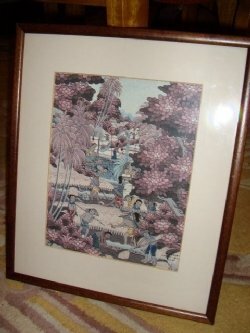 The Measurements are19 Inches x 15 Inches overal to include the frame. 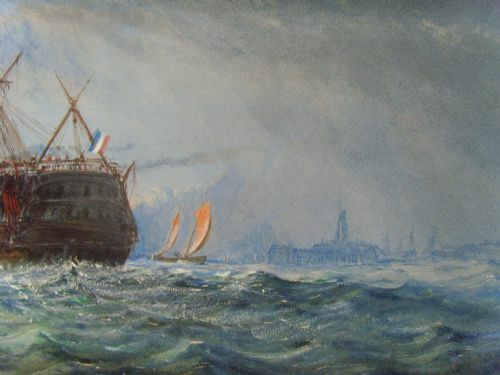 The Actual Watercolour is itself 13 Inches x 9 Inches. PLEASE CALL US FOR A FRIENDLY CHAT. 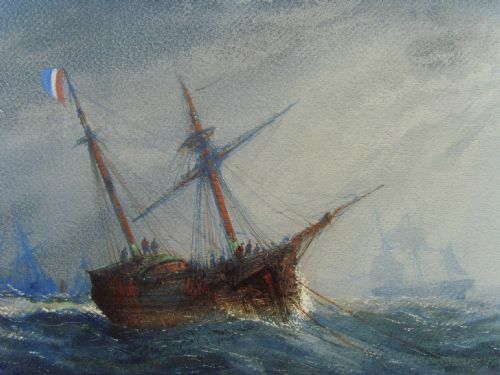 MARINE WATERCOLOUR OF A DAMAGED FRENCH WARSHIP WITH ITS SAILS REEFED & HEELING OVER IN THE STRONG WINDS REQUIRING RESCUE & TITLED VERSO "GALE OFF THE FRENCH COAST" BY ARTIST JOHN ROBERT MATHER (B1834-D1879)APPROX.SIZE 33 X 20 INCHES OVERALL. 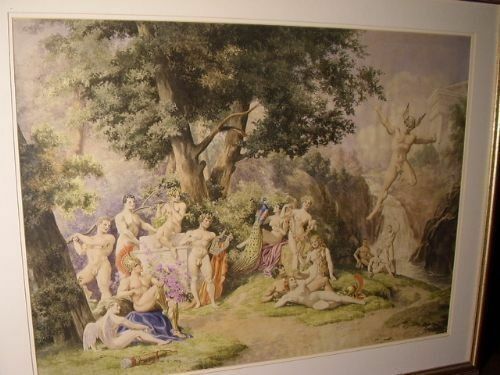 We are delighted to offer for sale this large and beautifully executed watercolour of exceptional quality by the Northumbrian artist John Robert Mather. We could not find a monogram on this painting, although the companion piece bears one, but it is unmistakably painted by the same hand. 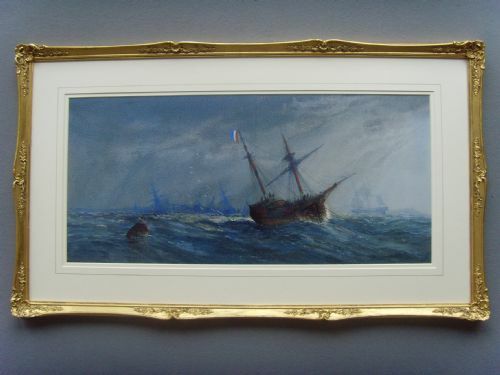 The painting is entitled verso on a piece of the original backing board, 'Gale off the French Coast', which is attached to the reverse of the more recent backing board. 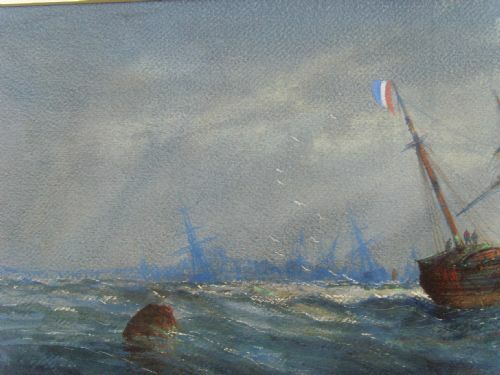 The painting depicts a French sailing vessel, with its sails reefed, heeling over before the wind in a gale. There are many figures on the deck of the ship. 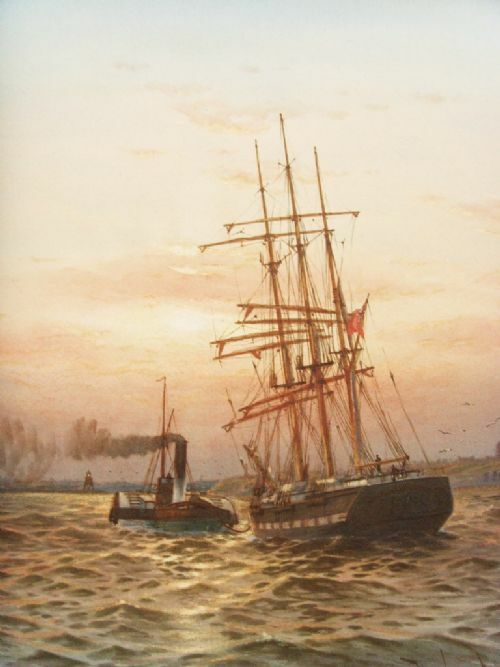 Other vessels can be seen also with their sails reefed and one can be seen with its sails billowing in the wind. The French coast is dimly visible in the background. 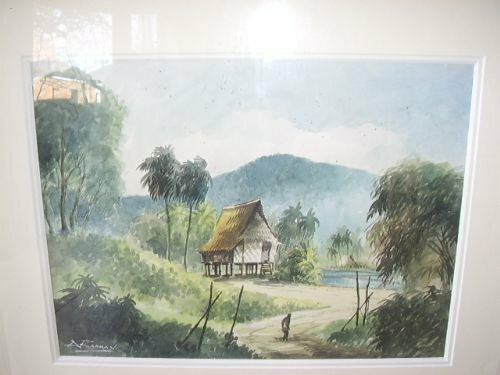 TITLE:"Gaol off the French Coast"
A superb watercolour by reknown artist A.J.Rahman painted in watercolour.This Malaysian artist is well respected in Asia and his rare works are shown today in their National Gallery and have been exhibited in London in the past. 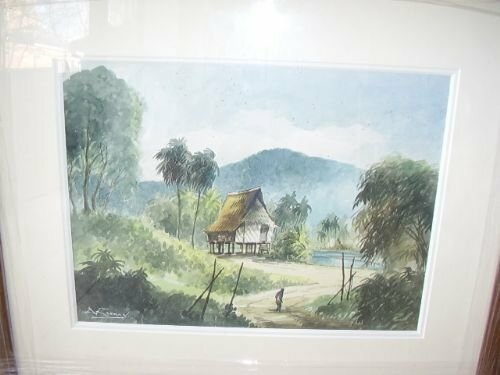 The paintings were traditionally drawn for people visiting the beaches whilst on holiday in Malaysia. They are rare to find today.I came across a selection of four which were rolled up in a cardboard tube awiaiting framing for the last 50 years.They are in excellent condition and are offered for sale separately or as a set. The picture has just been framed with new double edged bordering under glass.The overall size including the frame is 22 x 19 Approx.